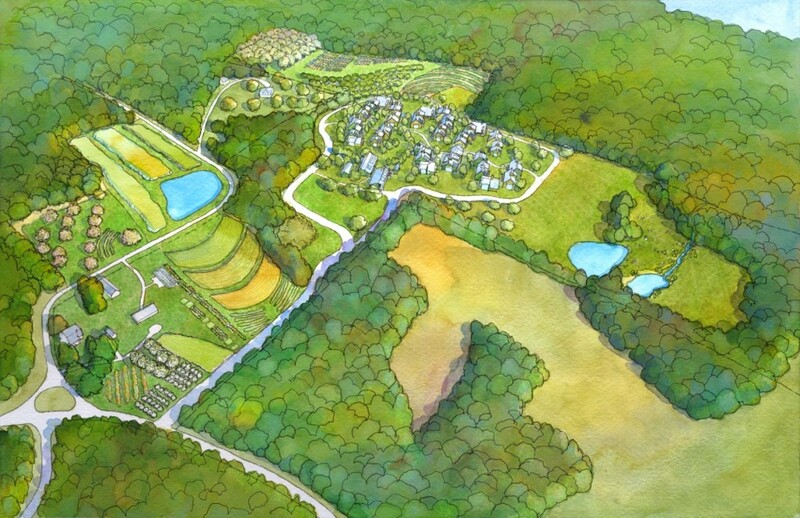 Rocky Corner is the first cohousing neighborhood in Connecticut and the only one in the Tristate area of CT/NY/NJ. We are presently building on our 33-acre former dairy farm in the town of Bethany. With a beautiful New England setting, yet only about five miles north of New Haven, this is an inclusive, multi-generational community, valuing diversity of culture and background. Many homes are spoken for, but we have all sizes available (1,2 and 3 bedrooms). Move in is planned for spring 2019. Caring deeply about the health of the planet we are committed to green building and living sustainably. With Centerbrook Architects we have cooperatively designed 30 passive solar, single family homes. These are clustered near the 4,500 square foot common house for shared meals, leisure, and work space. We were chosen to receive a large grant from the state of Connecticut to help make some of our homes “affordable” (below market rate). Working with Appleseed Permaculture to make the best use of the farmland and watershed, we are creating a landscape of flowers, berries, orchards, annual vegetables, pasture, wild flowers, paths and ponds. We have planned a community garden of 20'x40' plots for residents to grow a substantial amount of food and a greenhouse for an extended growing season. The site plan is people-centered, with cars on the perimeter yet conveniently accessible to each unit. Valuing participation, we have adopted sociocracy as our organizational and decision-making model, and have trained with John Buck, Jerry Koch-Gonzalez and Diana Leafe Christian. The homes range in size from one bedroom to three bedroom. Universal design makes them perfect of people with physical disabilities and for aging in place. At this time we have affordable and market rate homes of all sizes for sale. Please contact us if you are interested in purchasing a home or for more information about Rocky Corner Cohousing. Rocky Corner -- a great place for families, for singles, for aging in place; a safe, cooperative, supportive community.